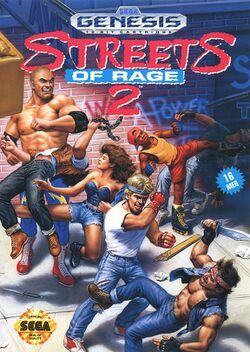 Streets of Rage 2, known as Bare Knuckle II (ベアナックルII, Bare Knuckle II?) in Japan and Streets of Rage II in Europe, is a side-scrolling beat 'em up first released by Sega in 1993, and is the sequel to the popular Streets of Rage. It features new music by Yuzo Koshiro (inspired by early '90s club music). It features better graphics, more moves, and longer stages than ever before. The cast of playable characters is also expanded: Adam is no longer available but his place is taken by Skate and Max, raising the roster to four. It was followed by a sequel called Streets of Rage 3. The game's immense popularity led to its inclusion in various compilations, including Sega Smash Pack Volume 1 for the Sega Dreamcast and Sonic Gems Collection for Nintendo GameCube, PlayStation 2 (Japan only). One year has passed since ex-peace officers Adam Hunter, Axel Stone and Blaze Fielding broke the Syndicate's hold and destroyed its leader, the mysterious "Mr. X". Peace has returned and the three heroes come together to celebrate the anniversary of the events. While Axel and Blaze moved out of the city, Adams still lives their, together with his kid brother Eddie "Skate" Hunter. The morning after the party, Eddie finds the house a total ruin and Adam kidnapped. This marks the beginning of the return of the gangs, even worse than before. The guys at the police force who provided backup last year are no longer available. However, Adams brother "Skater" and Axel's friend Max join forces with Blazer and Axel to once again defeat Mr. X. This page was last edited on 30 May 2016, at 14:22.